On 24 June 1314: The second day of the Battle of Bannockburn. After spending the night camped on the area of ground known as the Carse, the English army moves out and crosses the Bannockburn. 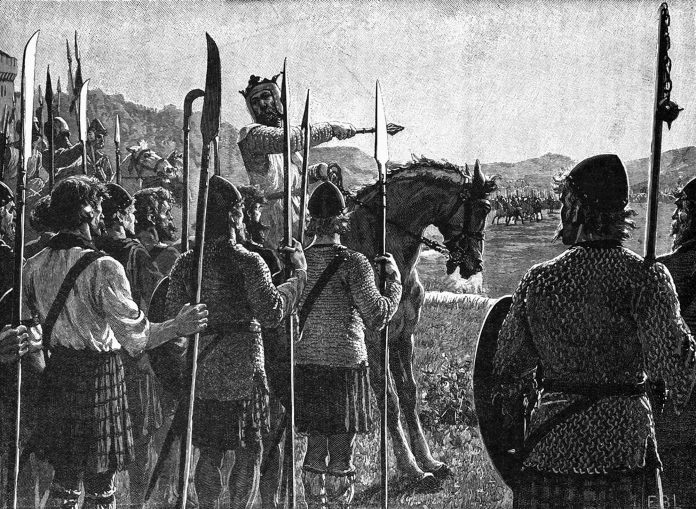 They are then met in open battle by the spear-armed schiltron formations of Robert the Bruce’s army. The English and Welsh longbowmen were not deployed effectively and were soon scattered by a cavalry charge, led by Sir Robert Keith. The sturdy schiltrons, supported by archers, succeeded in defeating repeated English cavalry charges and began to drive the English army back into the streams and bogs behind them and they are soon overwhelmed and driven from the field. On the morrow an evil, miserable and calamitous day for the English; when both sides had made themselves ready for battle, the English archers were thrown forward before the line, and the Scottish archers engaged them, a few being killed and wounded on either side; but the King of England’s archers quickly put the others to flight. Now when the two armies had approached very near each other, all the Scots fell on their knees to repeat Paternoster, commending themselves to God and seeking help from heaven; after which they advanced boldly against the English. They had so arranged their army that two columns went abreast in advance of the third, so that neither should be in advance of the other; and the third followed, in which was Robert. Of a truth, when both armies engaged each other, and the great horses of the English charged the pikes of the Scots, as it were into a dense forest, there arose a great and terrible crash of spears broken and of destriers wounded to the death; and so they remained without movement for a while. Now the English in the rear could not reach the Scots because the leading division was in the way, nor could they do anything to help themselves, wherefore there was nothing for it but to take to flight. This account I heard from a trustworthy person who was present as eye-witness. In the leading division were killed the Earl of Gloucester, Sir John Comyn, Sir Pagan de Typtoft, Sir Edmund de Mauley and many other nobles, besides foot soldiers who fell in great numbers. Another calamity which befell the English was that, whereas they had shortly before crossed a great ditch called Bannockburn, into which the tide flows, and now wanted to recross it in confusion, many nobles and others fell into it with their horses in the crush, while others escaped with much difficulty, and many were never able to extricate themselves from the ditch; thus Bannockburn was spoken about for many years in English throats.